KGW’s Joe Smith spoke to Vince Porter from the Governor’s Office of Film and Television, Mayor Sam Adams, Doug Boss, owner of Pacific Grip and Lighting, and Lana Veenker about the new NBC series “Grimm” that the Film Office has confirmed will begin shooting in Portland in July. PORTLAND, Ore. — Once upon a time in a place not too far away, the producers of a new NBC show chose the Rose City to bring its production. It’s not a fairy tale, but a true story. The show “Grimm” is a cop drama based on the Grimm fairy tales. It’s also is a showcase for Oregon’s growing film industry, with hundreds of jobs in the starring role. Producers spent weeks in Portland filming the pilot for the show, then waited. Would the network like it? They did. The next question: Where would the series itself be filmed? “NBC let us know they’re committed,” said Vince Porter, Executive Director of the Governor’s Office of Oregon Film & TV. Porter says the network’s decision to film the series in Portland is having a ripple effect though Oregon’s film community. But, as much as the producers love Portland, they also love the tax credits Oregon is offering. A percentage in cash rebates goes to the production company for spending at least $750,000 in Oregon on wages and service. That’s an easy reach for Grimm. “It can really tip over $2 million an episode,” said Porter. There are also other incentives: no sales tax, and built-in crews and services, from cameras, to lights to action with northwest actors. “The minute Grimm starts up they’re going to hire 150 people and by July there will be 250,” says Lana Veenker, a local casting director who cast eight local actors for the pilot. Link to full article and video. Thanks once again to Bonnie Gillespie for featuring Portland in her column The Actors Voice – POV for Showfax.com. This fantastic contribution from Portland casting director Lana Veenker is not one meant to warm the hearts of Los Angeles-based actors, hoping production is headed back to Hollywood. It’s a column about how local talent has stepped up its collective game to attract–and retain–major productions in the past few years. “Come for the tax breaks; stay for the talent,” could be the new minor-market motto, you might say. Was the local talent pool deep enough to fill the needs of their show, episode after episode, season after season? 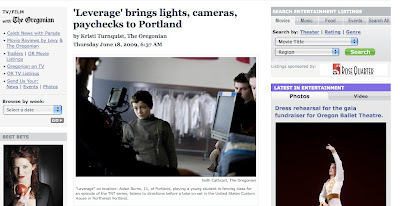 Sure, my Portland-based company had provided casting on some big movies (including Twilight, Extraordinary Measures, and Feast of Love, to name a few) and some smaller ones (such as Gus Van Sant’s Paranoid Park), but it had been at least 15 years since a television series had set foot in the state. Film and television production had just begun hitting its stride in Oregon when British Columbia implemented its film incentive program in the 1990s. This move–combined with a favorable exchange rate on the Canadian dollar–all but killed the momentum in the Northwest. Hollywood began to look past the forests, mountains, and lakes of Oregon, to the forests, mountains, and lakes of Vancouver BC and surrounding areas. Many Northwest actors and crew who had been earning a decent living in their hometowns were suddenly faced with the decision to either uproot their families and move to Los Angeles (where there was still work to be found), or leave the industry altogether. 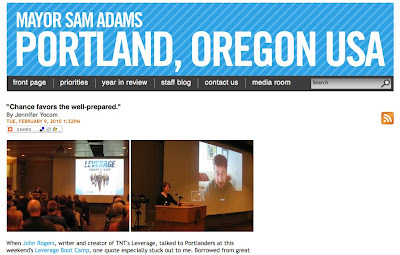 Based in part on that assertion, Leverage announced a few months later that it was coming to Oregon. I knew what this meant to our film office, to the hundreds of crewmembers counting on these jobs, to Northwest actors searching for a reason to stay here, and to my own bottom line. I understood the financial commitment that Electric Entertainment was making–and the damage my career would sustain–if I failed to live up to my word. I thought we had a strong enough base of actors to meet the demands of the show, but I had no idea whether or not our talent pool would truly meet their expectations, nor for how long. My office organized a “town hall” meeting, which was attended by hundreds of Northwest actors. This time, it was my turn to throw down the gauntlet. An entire production company was moving its TV show to Portland, partly on my word. To prepare for it, I told actors, we were expanding our offices and staff, and upgrading to a new online casting system. Now, I needed them to deliver the goods. We challenged our talent pool to do everything in their power to up their game, whether that meant getting new headshots, assembling more professional demo reels, improving their online presence (website, IMDb, etc. ), or recommitting themselves to ongoing training. I knew we had a number of actors who could compete in any market, but I was concerned that we might use them all up in our first season. I needed the next generation to step up and meet the challenge. And man, have they done so! I can’t keep up with the number of weekly industry nights, script readings, and screening events going on in Portland, much less the countless independent films and webseries shooting around town. Our top acting coaches’ classes are filled to capacity, workshops are selling out, and it seems like every actor I encounter is in a show, penning a script, producing a short film or feature, volunteering as a reader in casting sessions, or simply focused wholeheartedly on training. Talent agency rosters are filling out with new actors we never knew about before, and highly professional on-camera talent are hoofing it from as far away as Bend, Eugene, Ashland, and Medford to attend our casting sessions in Portland, never complaining about the commute. In my 11 years of casting in Oregon, I’ve never seen actors this motivated. And their determination is paying off. Homegrown filmmaker James Westby–whose film Rid of Me features a cast made up almost entirely of Northwest actors–has captured the attention of the prestigious TriBeCa Film Festival (his previous made-in-Oregon feature, The Auteur, was hailed by TriBeCa organizers as “the funniest film in the festival”). 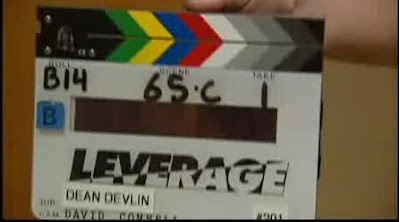 We are now in our third season of casting on Leverage, with over 38 episodes under our belts. Its producers and directors are still as thrilled as they were their first year in town, when they realized that–although they had budgeted to fly up four or five actors per episode from LA–the average (not including name actors hired to satisfy the network) was closer to one per episode. At times, none are flown in at all, local actors having snagged all the guest star and co-star roles themselves. Meek’s Cutoff starring Michelle Williams, Restless by Gus Van Sant, and Extraordinary Measures starring Harrison Ford, all filmed in Oregon in 2009. The IFC series Portlandia (starring Fred Armisen and Carrie Brownstein) shot six episodes in Portland last year, and just got picked up for another ten. TNT has increased its order for Leverage from 15 episodes in season two, to 16 in season three, to 18 this year. NBC chose Oregon for its made-for-TV-movie A Walk in My Shoes in 2010, while Brain Trust (the TBS pilot we cast in December) may go to series this fall. 2011 is projected to be the busiest year for film and video production in the state’s history. So far this year, in addition to the first few episodes of Leverage season four, we have cast Grimm for NBC (the highly anticipated pilot by the producers of Buffy the Vampire Slayer and Angel), and Gone, a Lakeshore Entertainment thriller starring Amanda Seyfried. If Leverage and Portlandia continue to be successful, and Grimm and Brain Trust both get picked up, we will have four television series shooting concurrently in and around Portland. I’ve heard the rumblings of more Hollywood films joining this wagon train in months to come, and local actors continue to lend their talents to dozens of indie projects, plays, commercials, industrials, infomercials, and voiceover gigs. In fact, more and more Northwest actors are now piecing together a fulltime living from their acting endeavors. This would have been almost unheard of just a few years back. They have created an environment that supports and cultivates a world-class talent pool a thousand miles from Los Angeles, and three thousand miles from New York City. Kudos to you, Lana, and to all the local talent keeping so many major productions so well cast and well acted! Let’s hope all actors with the opportunity to work under local hire status in other markets see this as a great time to take advantage of all the great stuff going on. Congratulations, Portland, on getting better and better! Very exciting! Lana Veenker began her career in London as a casting assistant on international co-productions for major studios and networks. When the Portland native returned to her roots in 1999, she launched what is now the Northwest’s most successful casting company, helping to raise the bar on what producers can expect from a regional talent pool. 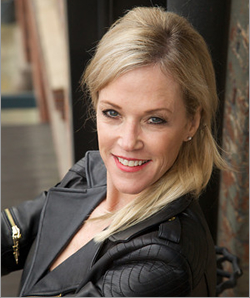 She is a member of the Casting Society of America and the International Casting Directors Network. In case you missed this the other day, Oregon filmmakers visited the State Capitol in Salem last week to testify before the Joint Tax Credit Committee on HB 2167, the bill that would extend and expand our state film incentive program. Committee members later said that this hearing was a model for how legislative hearings should go, as Oregon film industry members painted a very clear picture of the value of our incentive program from every possible angle. Legislators first heard testimony from Dean Devlin, Executive Producer of TNT’s Leverage, Vince Porter, Executive Director of the Governor’s Office of Film and Television, Steve Oster, Producer of the NBC pilot Grimm and former Executive Director of the Film Office. They were followed by producers, crew members and vendors from around the state, a talent agent and casting director (moi! ), and two representatives from educational institutions offering Film Studies programs. RealPlayer required (free download here). Lana spoke with AP journalist Jonathan Cooper after testifying at Friday’s hearing on HB 2167 in Salem. SALEM, Ore. A state House committee on Friday advanced a plan to extend tax incentives credited with luring Hollywood producers to Oregon. The tax credits will expire Jan. 1 unless lawmakers vote to extend them. The Transportation and Economic Development Committee voted 6-9 to support an extension and sent the bill to a joint tax-credit review committee, which will iron out key details including how much the program will cost. The 8-year-old Oregon Production Investment Fund reimburses film and television producers for up to 10 percent of wages and benefits for Oregon-based workers, and 20 percent of other expenses incurred in Oregon. Money in the fund comes largely from donations from individuals and corporations, who get a tax credit to offset their gift, plus an additional 5 percent to 11 percent. For donors to the fund, HB 2167 would extend the tax credits through 2017. Proponents initially proposed increasing the total available funding from $7.5 million per year to $20 million per year, but the committee on Friday stripped the maximum cost from the bill for a future decision. Supporters say the film subsidies create jobs on film crews and draw Hollywood visitors to local hotels and restaurants. “This is going to be the biggest year ever for Oregon film, and it’s 100 percent thanks to the film incentives,” said Lana Veenker, a Portland casting firm owner who has done work for TNT drama “Leverage” and the NBC pilot “Grimm,” among other productions. Free money AND more films in Oregon? Read on. If you’re an Oregon resident, now’s your chance to make a few extra bucks AND help Oregon’s film industry in the process…which means more jobs right here in our lovely state. The Governor’s Office of Film & Television is selling tax credits. They have about $3.5M available. If you buy $1000 in credits, you’ll get $1050 back (5% interest), and it helps the Film Office bring more projects here. Free Money AND More Films! 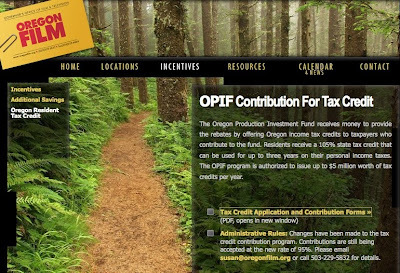 To take advantage of the Oregon Production Investment Fund (OPIF) Tax Credit, follow the instructions on the Oregon Film website. You can make a contribution of any amount in the year in which you plan to take the credit, then simply submit your contribution, complete the application and mail it off as instructed. Please spread the word, if you know of anyone else who may want to pitch in for Oregon film and make a few bucks in the process. Yesterday’s efforts in Salem gave our film incentive bill SB621 real LIFE, when hopes had all but faded! Legislators were amazed by all the calls, emails and personal visits. By the end of the day, there was quite a buzz around the Capitol about our little bill. We don’t know who the hero in the Legislature is going to be, but we may know by this afternoon. Hints that there is real hope have come in, so everyone please keep sending your positive thoughts. That being said, the Governor’s own budget blew up twice yesterday, so there is no way to know what will happen. Your last efforts may just be the tipping point that our bill needs to pass! SB621 can provide my next job. Please help Oregon’s blooming FILM INDUSTRY and vote YES on SB621. A list of email addresses is below for your convenience. Thanks, everyone, and keep your fingers crossed! 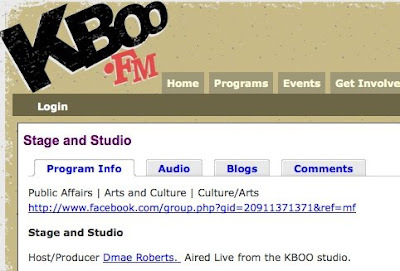 This morning, Dmae Roberts, host of Stage and Studio on KBOO FM 90.7, spoke with Oregon casting director Lana Veenker about the economic impact that national shows like “Leverage” and films have our acting and technical arts community. Click on the “Audio” tab to listen (Lana’s interview starts at about 16:06, after Portland Actors Ensemble talks about Shakespeare in the Parks). 1. Call or email your Oregon Legislators NOW and ask them to support SB 621, as it will create immediate jobs for Oregonians in our blooming film industry. 2. If you have a good story about how our film incentives have benefited you, please be sure to share it with them. 3. Write or call House Speaker Dave Hunt (503-986-1200) and Representative Peter Buckley (503-986-1405). The fate of the bill is largely in their hands and it could die in the next couple days, if we don’t convince them to let SB 621 have a hearing and a work session. With the Revenue Committee having closed, it is hard to say exactly what will convince the Oregon Speaker of the House Dave Hunt to re-open the bill that brings more work to Oregon by enhancing the Oregon Production Investment Fund. Your opinion may be what persuades him. Or maybe sheer volume will. Either way, please engage your civic self today. * 621 is a job creation bill that can be immediately employed by the Oregon Legislature. * Give SB 621 a fair hearing and work session in the House of Representatives. The work that has gone into this bill from the industry, the unions, the Oregon Senate and the Oregon Governor warrants a fair hearing in the House. * SB 621 has a with a no-risk structure that places the investment risk on the participating business, not on the state government. Please be forceful, but try to keep it positive. If you have talked to another Oregon Representative and they are supportive of 621, ask them please to take our case to Hunt and Buckley. THIS IS OUR LAST CHANCE TO SAVE SB621, THE BILL THAT WILL BRING JOBS TO OREGON. We’ve asked those in the Oregon film and video community on many occasions to write to their legislators about SB621 (Oregon Production Investment Fund), the Senate bill that would expand our film incentive program, so we could come closer to year-round production in our state. This is another urgent time for your response or we will probably lose SB621. Here are two things you can do. 1. Send an email to Representative Barnhart, Representative Buckley and Representative Hunt and ask them to let SB 621 have a hearing on Friday, June 19. Tell them that in light of the record 12.4% unemployment rate (as reported in Thursday’s Oregonian), it is only fair to give SB 621, the JOBS bill, a hearing. RUMOR HAS IT THAT REPRESENTATIVE HUNT PLANS TO WRAP UP REVENUE COMMITTEE HEARINGS ON FRIDAY, JUNE 19. IF SP621 IS NOT ON THE LIST, IT WILL NOT BE HEARD AND WILL NOT GO TO A VOTE. 2. The executive director of the Oregon Center for Public Policy, Chuck Sheketoff, is someone that people on the House Revenue Committee pay attention to and if film workers don’t respond to his post on BlueOregon.com, it is unlikely SB 621 will get out of that committee and thus, will kill the bill. Please log on to BlueOregon.com and in your own words, tell folks that you rely upon the very jobs that OPIF brings to the area. You can explain that the general fund fully receives back the money spent on the incentives from the taxes and fees generated by the projects that would not have come without the incentives. The incentive money is only given out after proof is provided that the project has already spent the money in Oregon. The study referred to was conducted by a ECONorthwest, which folks in the legislature regard highly. THIS IS OUR LAST CHANCE TO SAVE SB621. PLEASE ACT NOW! Check out this article on the economic impact of film and television production in our area! Please continue to contact your Oregon legislators; SB621 is still hanging in the balance. With a record 12.4 percent unemployment rate in Oregon and about 12 percent unemployment in Portland, there’s at least one bright spot on the local job horizon: Hollywood has come to town — and been hiring. Lana Veenker has spent the past several weeks sending out e-mails like this: “URGENT CALL FOR 60 EXTRAS ON ‘LEVERAGE.’ ” The pressure’s been on for Veenker, who runs her own casting company. But she’s not complaining. Lots of work? In this economy? Veenker and other members of Portland’s filmmaking community say they welcome it. To help support this bill, bringing jobs and revenue to Oregon, please contact your State Representatives ASAP. NO TIME TO WASTE! SENATE AND HOUSE TO VOTE THIS WEEK!! I also received a version of this bulletin from the OMPA and felt it was worth sharing. If you live in Oregon, please do your part! 3. Hand it to someone else. 4. Then open this link. 6. Open two emails, subject line “Support 621,” and address one to your Senator and one to your Rep. I am a constituent, as well as a member of the Oregon film and video community, and I strongly support both SB 863 and SB 621. The Legislature should be commended for passing SB 863, however, it represents only a reallocation of existing funds. SB 621 is the economic impact bill that will immediately bring high-wage jobs to Oregon at a time when we really need them. Film and video is a green industry that impacts businesses all across the state, including hotels, restaurants, payroll companies, car rental companies, hardware stores and antique shops, not to mention local cast and crew. It raises the profile of our state and brings much needed tourism dollars into our coffers. Production companies are clamoring to come shoot in Oregon, but they will not do so without a strong incentive program. The Oregon Production Investment Fund has already proven its ability to turn one dollar into four; a return unheard of in the current climate. Our industry is indeed the only bright spot in an otherwise bleak economy, however the Film Office finds itself in a position of having to turn major productions away half way through the year, because current levels are not high enough to meet the demand. With SB 621, we will come closer to being able to fund year-round production, laying the foundation for the growth of this clean industry, and providing good-paying jobs for Oregonians across the state. I am asking you to please support SB 621 and encourage your peers to do the same. Please spread the word! This bill will be voted on in just a few days. There’s literally no time to waste. Watch AM Northwest’s interview with Lana about the TNT drama series “Leverage,” shooting in and around the Portland area through mid-September. The series will bring jobs, tourism, revenue and a little glamour to the state, but more film incentives are needed to ensure year-round production in Oregon. Please write to your Oregon senators and representatives and ask them to support SB621 (Oregon Production Investment Fund), so that we can keep productions like this coming to Oregon all throughout the year. The film and video industry is green, immediately creates “shutter-ready” jobs, generates lots of revenue for a wide range of businesses, and helps bring tourism dollars to the state. Production is booming and can help us get out of this economic mess, IF we have the incentives to attract companies to choose Oregon over other locations. Find your legislators here. Make sure to mention that you’re a constituent.